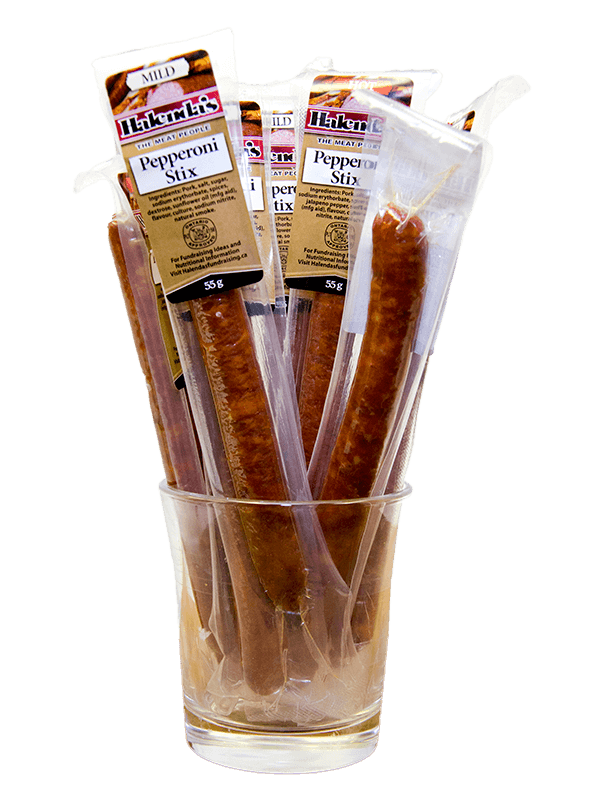 With Halenda’s Pepperoni Stix you are guaranteed to double your money (50% Fundraising Profit) with just one case. There is also an opportunity to make much more with our discounts on larger orders. Our pepperoni does not require refrigeration and has a long shelf life and this makes for simple fundraising. It takes about two weeks or less for order processing. Lead times vary based on available supply and customer demand. During peak season lead times may be slightly longer. See below for payment options. After payment is received you will be contacted with delivery options/details. One case contains 240 Pepperoni Stix organized in 16 resealable Halenda’s Fundraising bags for easy distribution to your team. Each fundraising bag has a delicious premixed assortment of 10 mild and 5 spicy wrapped Pepperoni Stix. We can assist you in personalizing our fundraising bags for your fundraiser. To order HOT ONLY cases contact info@halendasfundraising.ca before ordering. 15 people, given just 1 case each, can raise over $3900 profit for your group. You pay NO TAX on your Halendas order. No minimum order requirements and we ship anywhere in Ontario. How can a pepperoni stick be worth over $2,000,000? That’s how much money has been raised for sports teams, school groups and community projects from the sale of our delicious pepperoni stix since 2013. Use the below calculators to see how much money you can make with our unique fundraiser! Enter the number of cases you wish to purchase to see how much profit you can make or enter the amount of money that you would like to make to see how many cases you will need to order. To pay for your order by credit card, simply select how many cases you wish to purchase below and click the “Add To Cart” button. You will then be redirected to PayPal to complete your order. If you do not have a PayPal account you can choose to checkout without creating an account. Note that if you would like your order shipped to you, a $12 per case shipping charge is automatically added to your total. To pay for your order by either cheque or e-mail transfer, simply fill out and submit the form below. You will then be e-mailed further instructions to complete your order.